Making a choice between two advanced e-Commerce solutions might be even more difficult than choosing those among a hundred of other ones. And yet the decision has to be done - the decision that will inevitably impact the way you’re running your business, operating the store, and making sales. This time in our shopping cart comparison blog series, we’ll put under the microscope two highly popular platforms that fully deserve their praise and glory - Shopify vs Volusion. Both hosted, innovative, and functionally abundant, they seem alike at first sight. However, our aim is to spot how do they differ, and how can those differences help you make a choice towards a felicitous e-Commerce solution. To begin with, neither Shopify nor Volusion requires any setup costs, offering a 14-day free trial for a test drive to everyone willing to. Also, both solutions (and every other platform out there, in fact) have credit card fee ranging from 2.4% + 30 cents per transaction. Like most of the hosted shopping carts, Shopify and Volusion impose monthly fees that vary by the plan you’ve chosen. Shopify starts at a price of $9 a month for Lite plan, and goes up to $29 for Basic, $79 for Professional, and $179 for Unlimited one. It’s important to note, that unless you’re using Shopify Payments to manage every your payment processing, the platform will also charge a 0.5% – 2% transaction fee every time you make a sale. The fee percentage depends on a plan you use (Starter 2% / Basic 2% / Professional 1% / Unlimited 0.5%). In return, Shopify provides you with an unlimited bandwidth to run the store. In contrast, though Volusion does not have transaction fees (except the one imposed by credit card companies), it’s bandwidth is limited. The costs start from $15 per month (Mini Plan) to $35 per month (Plus Plan), and raise up to $75 per month (Pro Plan) and $135 per month (Premium Plan), increasing the bandwidth from 1 to 35 GB correspondingly. In the case of purchasing an entire year at a time, you can get a pleasant bulk discount of 10%. The cost of an extra bandwidth is not specified. Aptly combining simplicity and robust functionality, Shopify and Volusion are fairly easy to setup, use, and maintain over the period of time. In common, both solutions come with a well-designed yet thought-out user interface, which allows to reduce the time needed to get up and start running the store to the minimum. That being said, Shopify has a bit easier learning curve. Upon starting a free trial, you are presented with a step-by-step guide (a sort of “wizard”) to adding products and setting up the store. Volusion, however, lacks a similar feature, which makes it a less friendly place for a novice. Also, Shopify is found to be considerably easier to customize. While an access to the raw HTML/CSS code edit can be get using both platforms, Shopify provides a simple, menu driven method to change the store’s outlook. With Volusion, however, the only way to customize fonts and colors of your theme is via editing raw HTML/CSS, which requires some expertise to be done, as well as bigger time expenditures. When it comes to themes, Volusion leaves Shopify far behind, but in quantitative measurement alone. Though Volusion suggests over 360 good looking templates, only 223 of them are responsive. In contrast, nearly every Shopify theme (out of 170~ available) looks awesome across mobile phones and tablets, as well as on a desktop, obviously. The best thing about Shopify themes is the fact that most of them are built by professional designers, which makes them up-to-date and elegant. Being moderately priced (up to $180 for the most expensive ones), every theme is pretty much affordable even for a newly established store. In any case, there’s always several free ones available to pick from. Talking about the free templates, Volusion is ready to offer as much as 80+ themes absolutely for nothing. This goes in contrast with the fact that the “premium” ones are priced for $895 per theme. And still, just a few of them are mobile optimized. Doing business is never easy. Being a newbie or a professional, you can’t omit running into some sort of a problem with your store. 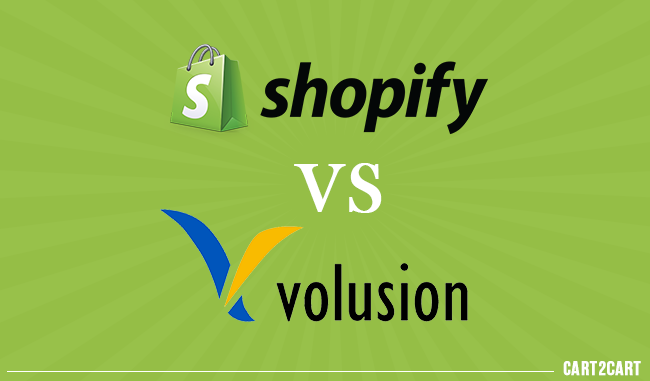 Fortunately, both Shopify and Volusion are caring enough to provide each of their users with 24/7 support. Either by phone, live chat or email, you can easily contact a qualified support consultant whenever it’s needed. In addition, Shopify has a dedicated forum to interact with an extensive Shopify community. Apart from technical issues, you also can discuss business related questions there too. You can’t build a full-featured store without utilizing several extensions. They can not only automate some of the mind-numbing, everyday operations, but expand your store’s functionality significantly, adding new, previously inaccessible features. Both Shopify and Volusion have marketplaces for developers to publish their creations, and for users to download them either for free or not. Shopify currently has an astonishing number of more than 1,100 high-quality apps available for download. Being built by independent service provides, many of the are paid, but worth the investment. Though Volusion extensions cover the most important categories too (marketing, shipping / fulfillment, customer support integrations, etc. ), their amount is incomparably slimmer - only 80 apps to choose from. This bitter fact gives a big advantage over Volusion, indicating the fact that 3rd party tools providers are more willing to integrate their services with Shopify solution. Platform’s popularity does not equal its quality. However, it is a good indicator of how much people trust the solution provider, its credibility in other words. According to the official data taken from the platform’s websites, Shopify powers about 4 times more stores than Volusion does, counting for 175 000+ and 40 000+ stores correspondingly. The numbers get even more impressive, if to consider the gap between their launch dates - Volusion had entered the business 7 years earlier (1999) than Shopify did (2006). That’s not a reproach to Volusion, however. While most of its “peer” e-Commerce solutions were kicked out of the market a long time ago, our hero is still a proud member of the top 5 hosted shopping carts club. Google Trends draws basically the same picture. Also, Shopify is the most popular hosted shopping cart which merchants migrate to using our service. One thought on "Shopify vs Volusion - An Honest Review"